Hammock camping is steadily growing in popularity as outdoor enthusiasts of all types are discovering just how comfortable sleeping in one can be compared to a tent. Hammock brands are also expanding their product lines and continue to design better gear for hammock campers. When you use the right equipment, chances are you’ll find that sleeping in a hammock designed for trail use is quite cozy and pleasant. However, you can further enhance your experience by using a sleeping pad, just as you might under your sleeping bag. In fact, if you’re camping in cool/cold weather, a sleeping pad is a very important part of a warm hammock setup as if will insulate you from below. Although you can make a standard sleeping bag pad work in a pinch, it’s really advised that you invest in a pad specifically designed for hammocks if you plan on using it often. The reasoning for this is that a hammock pad will be more stable and form-fitting to the shape of your sling compared to a standard pad that is designed to simply lay flat. If you’re in the market for a sleeping pad for your hammock setup, here are three excellent models to choose from. 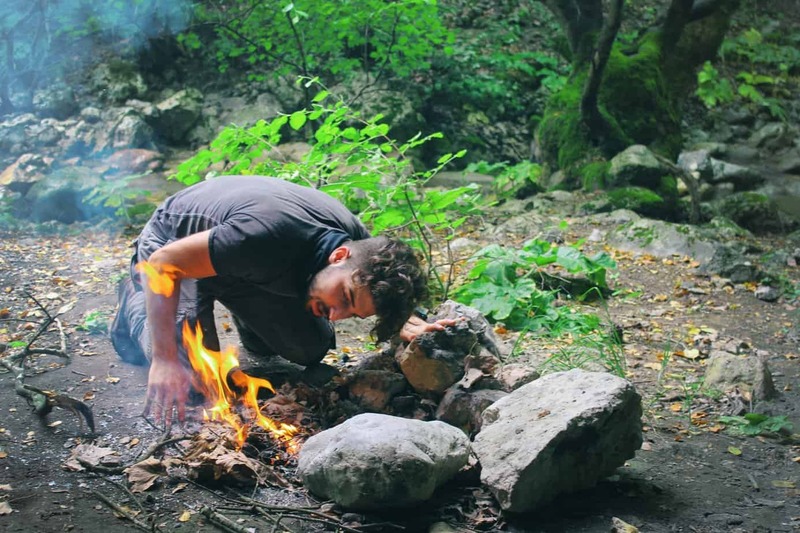 Klymit is a reputable outdoor gear brand that focuses mostly on the “creature comforts” of camping, such as sleeping bags, pads, pillows, blankets, and more. 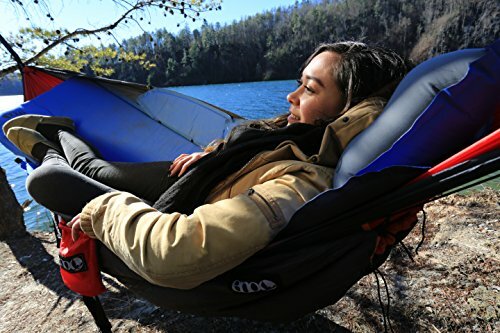 They have a dedicated hammock camping line of products, including one very cool model called the Insulated Hammock V. This sleeping pad was designed for two purposes – to allow hammock campers 4-season comfort and to prevent cold spots by reducing pad shifting. This bright orange 20D polyester sleeping pad has a 4.4 R-value insulation rating and weighs 35 oz. Its dimensions are 78″ x 47″ x 2.5″. This is an inflatable pad and will be fully inflated in 15 to 20 breaths. The Hammock V has glowing reviews and was even give a Best New Gear for Winter 2017 award by Gear Institute. This pad is designed to fit all standard hammocks, including standard-sized double hammocks. The Insulated Hammock V is stuffed with a synthetic insulation and stitched with a V-chamber design. This design reduces air movement, allowing your body heat to stay trapped in order to keep you warm. The wings on the sides of the pad help keep it in place, while also helping to keep your sides warm. Slipping is further kept at bay with the addition of a non-slip coating on the surface of both sides of the pad. The Klymit Insulated Hammock V is lightweight, warm, and easy to inflate. Non-slip coatings and flexible insulated wings really show that this pad was specially designed for hammock-use only. It packs down to roughly 5″ x 10″ to make it easy for backpackers to carry in their packs. The retail price of this model is $169.99 and is exceptionally popular, often being sold out. If you’re interested in this model, be sure to jump on it quick if you do find it available. Eagles Nest Outfitters (ENO) is a hammock-centric brand that’s a bit of a household name among hammock-camping enthusiasts. In addition to their highly recommended line of hammocks and related gear, they also make very well-liked pads. If you don’t care too much about weight and you really just want a lush, comfortable hammock experience, you need to look into the AirLoft Hammock Mattress. 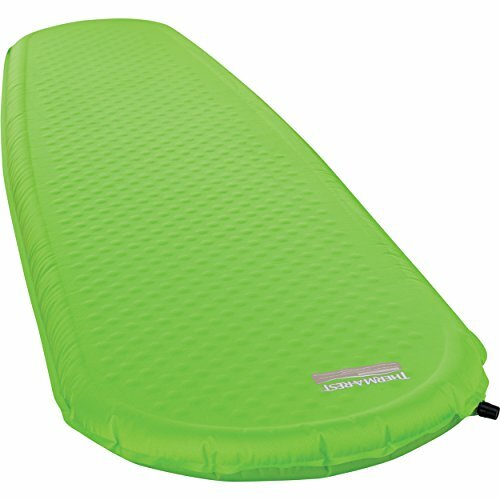 As its name suggests, the AirLoft is much more of a hammock “mattress” than a mere sleeping pad. This is a 45 oz insulated self-inflating air mattress, with an additional 1″ layer of solid-core foam insulation. The outer material is a durable TPU-coated nylon that isn’t too slippery. The total dimensions of the AirLoft are 80″ x 36″, including its detachable insulated wings. These wings can be removed if you wish, leaving the pad itself 21″ wide. You can also use the AirLoft as a regular ground tent sleeping pad if you remove the wings. The AirLoft is a bit bulky and heavier than other hammock sleeping pads, but despite these two downsides many fans find that the comfort it offers is worth it for car camping or shorter backpacking trips. The temperature rating is 40F-60F, but if regularly camp in the 40s you might consider purchasing the additional HotSpot (+$29.95) to give an extra boost of warmth. 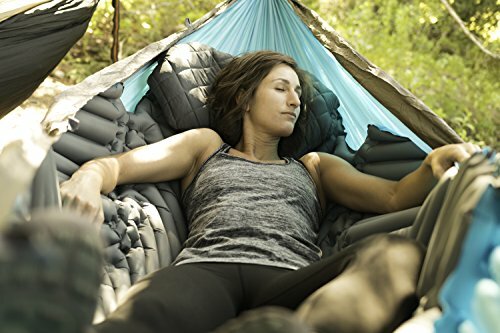 This hammock mattress retails for $94.95 direct from ENO, which is a very reasonable price compared to a hammock and standard insulated sleeping pads. If you need to still to a $100 or less budget, the Air Loft would be a great purchase, so long as you don’t plan on taking it on light or UL backpacking trips. Check out the latest price here! While dedicated hammock campers would do best sticking with sleeping pads specifically designed for hammocks if you happen to shift from a hammock and a tent you might get more use out of a dual-purpose pad. The right standard sleeping pad for tent camping can still work well for hammocks, depending on the design of the model. The Therm-a-Rest Trail Pro is the perfect example of a time-tested dual-purpose pad that will still perform well in a hammock. The Therm-a-Rest brand is a great company to buy a camping mattress from. It’s their specialty and they do it well, so it comes as no surprise that they are a good option for hammock campers. The Trail Pro is a self-inflating mattress originally designed for tent campers, but a surprising number of hammock campers have found it to work very well. The Trail Pro has a great warmth to loft ratio and isn’t overly large or bulky. It comes in three sizes – Regular, Regular Wide, and Large. All of the sizes offer a 4 R-value rating and are suitable for 4-season use. The only differences between the sizes are the width and length, which vary from 72″ x 20″ (1 lb 10 oz) for the Regular to 77″ x 25″ (2 lbs 2 oz) for the large. All pads are 2″ thick and have urethane foam insulation. The pad tops are made of 50D mini hex polyester while the bottom is a more durable 75D polyester. The Trail Pro retails directly from Therm-a-Rest for $99.95/$109.95/$119.95, depending on the size you choose. (Check the latest price here!) Therm-a-Rest has been around since ’71 and more than a few customers still have pads they purchased decades ago that they use regularly. The Trail Pro isn’t the best hammock pad, but it is one of the best versatile hammock & tent dual-purpose models. Campers that have made the change from the typical tent and sleeping bag setup to a hammock have found that they get a better night’s rest, waking up refreshed and without a sore back. Adding a sleeping pad to your hammock is a great way of adding additional comfort and insulation, helping to not just keep you comfy, but also makes sure you’ll be warm enough during those chillier nights. Not all hammock pads are created equal. To ensure you get the most bang for your buck, consider one of the featured models. The Mountain Hardwear Shifter Tent Review: Is it the Right Tent for You? The Darn Tough Socks Review That You’ll Love! The Five Ten Rogue Climbing Shoes Review – Is it What You’re Looking For?